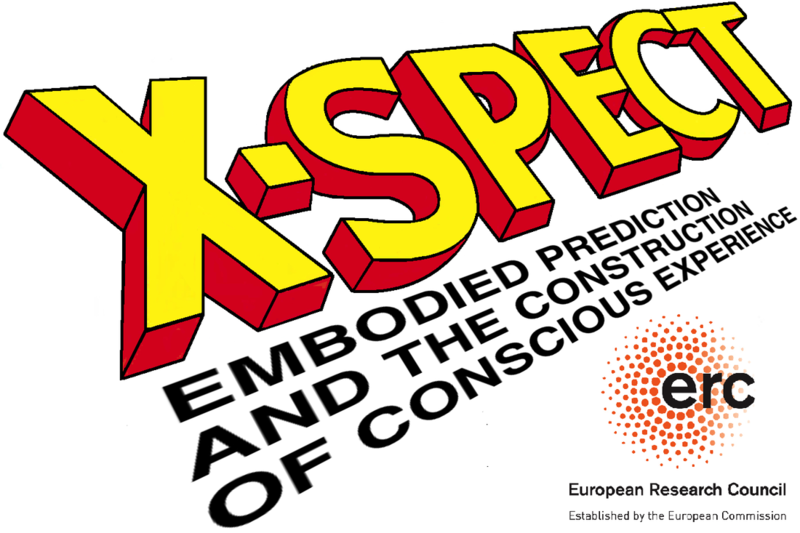 X-SPECT is a 4-year ERC-funded project based at the University of Edinburgh, Scotland, UK. The project is hosted by Eidyn, Edinburgh Philosophy's interdisciplinary research hub. The full project title is “Expecting Ourselves: Embodied Prediction and the Construction of Conscious Experience”. It aims to leverage recent work on the predictive brain as a way of shedding new light on the nature and possibility of conscious experience. A secondary, but crucial, aim is to relate the resulting story to existing conjectures concerning the neural correlates of conscious experience. At the heart of our project lies the emerging image of the brain as a multi-level prediction machine. According to such accounts, incoming sensory signals are processed relative to a multi-level, multi-area neuronal organization that seeks to predict the evolving flow of sensory information. These, mostly unconscious, predictions prepare us to deal rapidly and efficiently with the stream of signals coming from the world. If the sensory signal is as expected, we see and hear the things that we have already started to prepare to see and hear, or launch behaviours that we have already started to organize. But if all is not as expected, then a distinctive signal results: a so-called ‘prediction-error’ signal. These signals, calculated in every area and at every level of neuronal processing, highlight what the prediction engine - or 'generative model' - got wrong, and invite the brain to try again armed with specific information concerning current errors. Brains like this are forever trying to guess the shape and evolution of the current sensory signal, using stored knowledge about the world. Human experience, this suggests, always involves a delicate combination of what the brain (on the basis of what we know) 'expects' and what the current waves of sensory evidence suggest. This fits well with daily experience. We easily see and hear that which we know well, even when conditions are noisy and bad – for example, when someone speaks our name in a noisy party, or when we hear a familiar song played on a bad radio receiver. In such cases, the brain uses stored knowledge to drive rich predictions about the sensory array: predictions that that help separate the signal from the noise, adding to, and subtracting from, the sensory flux so as to reveal (when all goes well) what really matters in the wider world. By seeing experience as a construct that merges prediction and sensory evidence, we begin to see how minds like ours reveal a world of human-relevant stuff. For the patterns of sensory stimulation that we most strongly predict will be the patterns that matter most to us as both as humans (with distinctively human needs and capacities) and as individuals – individuals with different histories and interests. The world revealed to the predictive brain is thus a world already permeated with embodied human mattering. Our project is split into three sub-projects, each of which applies this vision to different aspects of the puzzle of conscious experience. Along the way, we will use new experimental probes to bring philosophical work on the nature, structure, and origins of conscious experience into close and experimentally informed contact with neuroscientific conjectures concerning the predictive brain. The first sub-project looks at the links between prediction, experience, and embodied action. The key idea to be explored is that predictions impact conscious experience in ways that are intimately bound up not just with our own perceptual history but also with ongoing motor planning and activity. This part of the project involves experimental work designed and led by Dr David Carmel, Psychology, Edinburgh. The second sub-project targets the role of inward-looking (‘interoceptive’) predictions on experience – these are predictions of our own changing physiological states. The idea to be explored, both philosophically and experimentally is that much of the distinctive ‘feel’ of conscious experience may be due to the influence of interoceptive information on the selection and construction of the winning predictive model. Some of this work will be carried out at the University of Sussex with project partner Professor Anil Seth. The final sub-project addresses more specifically human forms of conscious experience, including the kinds of reflective self-awareness required to notice and discuss our own basic (‘qualitative’) conscious states. The here is that more advanced (reflective, self-aware, agentive) forms of experience arise when the neural prediction machinery is turned upon itself – when we ourselves appear as elements in our own predictive world models. Hence the title of the overall project ‘Expecting Ourselves’. Such self-expectations may first arise when bedrock prediction routines are deployed in the special context of cultural practices that involve coordinating our behaviors with those of other agents. For this part of the project, we will be working closely with project partners Professor Andreas Roepstorff (Interacting Minds Centre, Aarhus University, Denmark) and Professor Karl Friston (Wellcome Trust Centre for Neuroimaging, University College London) . Putting the three threads together delivers a new and exciting perspective on conscious experience. Basic conscious experience emerges when predictive brains enable embodied, interoceptively-informed agents to perceive a structured world apt for action and choice. Reflective self-consciousness arises when such agents model themselves and others so as to enable increasingly complex forms of goal-directed behavior and social interaction.